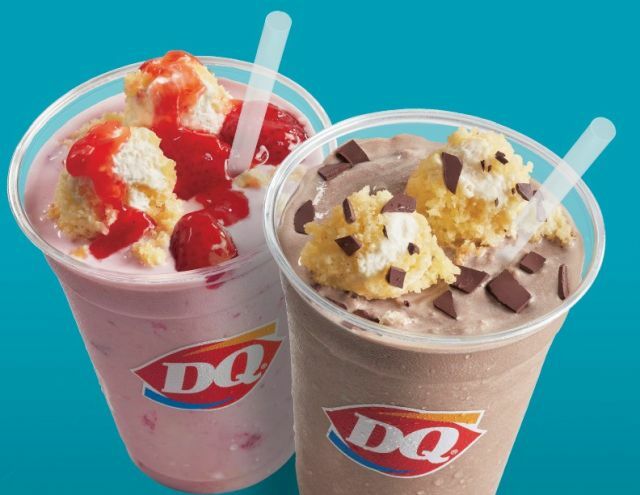 Dairy Queen blends up new Cake Shakes featuring soft serve spun with cake and topped with more cake. Available for a limited time at participating locations, Cakes Shakes come in two varieties: Chocolate and Strawberry. The Chocolate Cake Shake consists of chocolate topping blended with milk and vanilla soft serve, mixed with vanilla layer cake, and then, topped with thick pieces of vanilla layer cake and choco chunks. The Strawberry Cake Shake consists of strawberries blended with milk and vanilla soft served, mixed with vanilla cake, and then, crowned with vanilla layer cake pieces and strawberry syrup.